Hi, I'm gonna rebuild my baby 8. Currently I've built the most basic setup with a single CV out - I'm going to add a gate, as according to the fonik version of this sequencer, which I feel folks are familiar with: http://modular.fonik.de/pdf/baby10.pdf . I'm wondering if there are options for regulating the length of the gate. 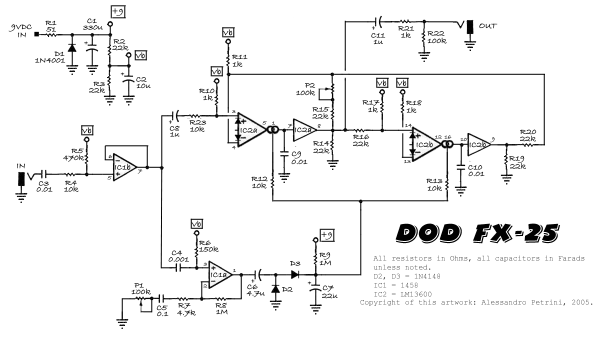 I got a 5 dollar DOD envelope generator; I read that Flea from the Red Hot Chilli Willies used one and so I decided it best to take it apart and try and use it in a synth. Does this make some sense or not? Otherwise, has anyone fooled around with adding some sort of AR to the gate or figured out a way to control its length? I'm a beginner, have had a lot of fun with this sequencer already, trying to advance it, while not listening to RHCP. do you want a different length per step ? what power supply ur using? No, I would be glad to have a uniform length which applies to each step. For adjusting the length I'd suggest a 555 (preferably a CMOS version) in monostable mode. than the length of the signal it receives on pin 2 but you can get around that by using a capacitor in series. Maybe I'll draw a schematic later. You can also use a 555 to make a simple envelope generator and g.gabba designed some interesting simple envelope generators aswell. depends on how much effort u are ready to invest?